The thought of Italian food always evokes some great taste memories - piquant tomatoes, aromatic garlic, fresh basil and olive oil - simple ingredients which when used in a multitude of combinations with seasonal produce of a region can make even the simplest of meals an absolute culinary journey. Bene at Sheraton is hosting Chef Giuseppe Lioce from Westin Pune for an Italian festival that is on till the 23rd of May. 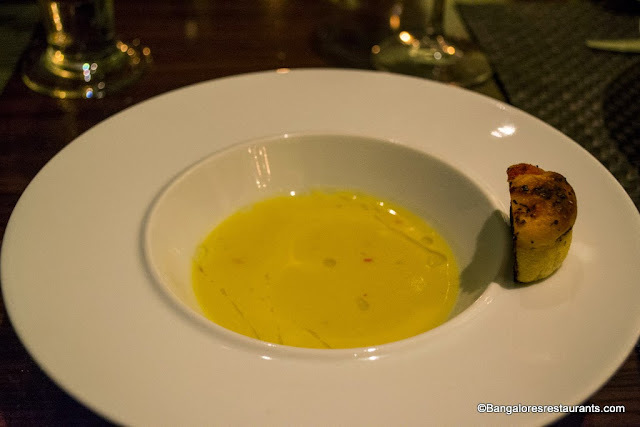 We were invited to partake of a tasting menu that promised to showcase the festival and believe you me, we came away promising ourselves to come back for more before the festival is done. Chef Giuseppe, like most Italian chefs, has that charming way about him. 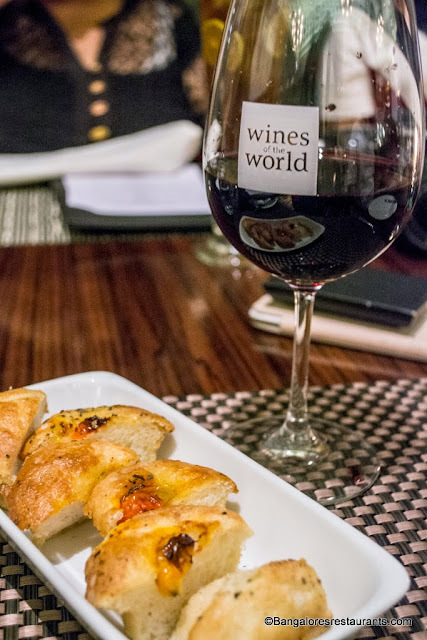 The first part of the meal, he explained would be a showcase of some of his childhood memories - coming home to find that his grandmother had prepared something delicious to nibble on, or those great snacks that accompanied tipple sessions when out with friends. We ate a lot that day and its only fitting that I take you visually through the meal. 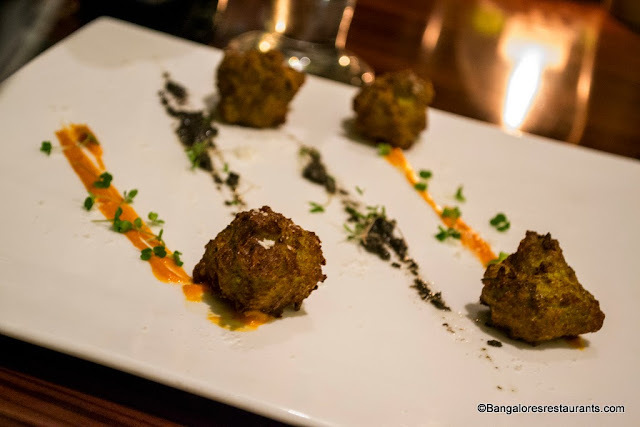 We began with the Pettole Pugliese as the Amuse Bouche - these with one-mouthful sized deep fried balls of pizza dough that had a light touch of olives and sun-dried tomatoes with some rosemary. As platters of these were placed on the table, chef came around with a glass that held some plastic injections filled with a bell pepper sauce. He asked us to pick a ball each, swipe the sauce below it on the plate, pop it into our mouth and then inject in the sauce. 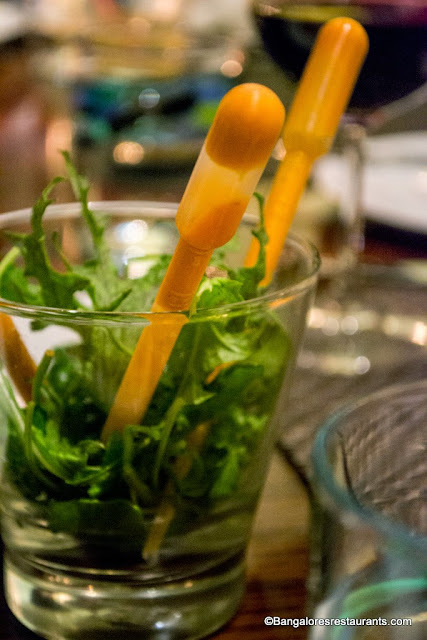 It made for a great start to the meal, to be able to play with it a bit. I thought pizza dough balls may end up being thick, doughy and chewy, but these were light, airy and disintegrated deliciously in the mouth with the sauce from the injection providing it the perfect passage into our tummies. Antipasti began with a carpaccio that you don't normally see - Carpaccio di Funghi. These wild mushrooms were thinly sliced and marinated in a lavender vinaigrette. Every bite gives you that light, flowery burst of aroma that spreads through your mouth and nose. These were served with shaved parmesan, green pea leaves and some edible girlanda flowers. I preferred to leave out the little dots of balsamic vinegar on the plate - it was too overwhelming with the otherwise delicate flavours. Next came the Frittele di Broccoli Calabresi, a throwback to Chef's good times with his friends and a dish commonly served in pubs. 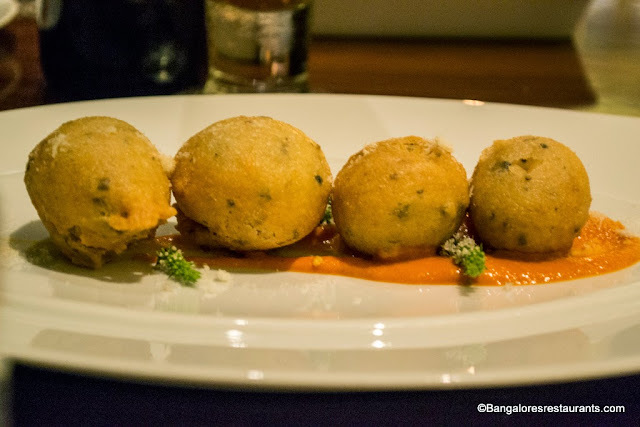 Put simply these are broccoli fritters with an olive Tapenade and Romesco sauce. Nice bite-fuls, completely non-greasy, but compared to the other dishes that were to come, not very memorable. On to the non-vegetarian antipasti - These were the two dishes based on which, I quite unabashedly announced that I would like to take Chef Giuseppe home - the Capesante Mare e Monti - generous sized scallops came served on bed of sweet pumpkin puree and done with with Crispy Parma ham, sauteed wild mushrooms and an infusion of truffle honey that I can still taste just looking at it. 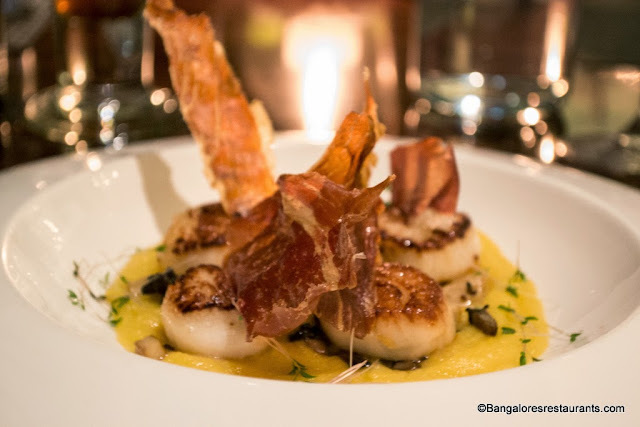 Getting good scallops is a tough ask in Bangalore and the respect with which these were treated has to be lauded. The infusion of the truffle honey made for a unique taste profile to the dish and the saltiness of the baked parma ham crisps completely made this a umami kind of dish. 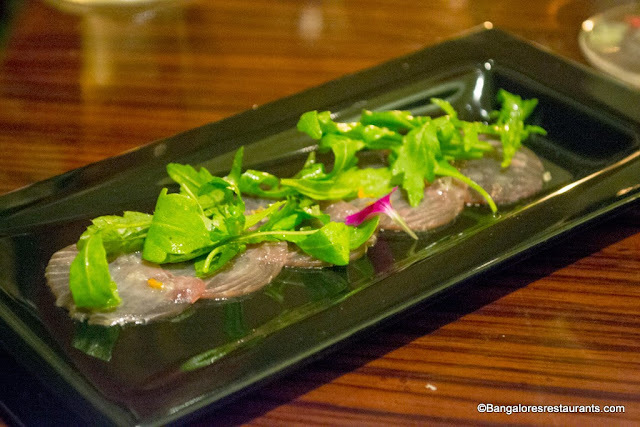 And then came the delicate looking Carpaccio di Tonno - Tuna Carpaccio with a light Italian dressing, rock salt infused with orange and a rocket salad. Lady Luck was shining down on us as we ended with an additional platter of the dish thanks to the one vegetarian dining partner at the table. We made good of it in a manner of seconds. Take my word, go slow with it as these are flavours you want to savour nice and slow. And now came the Zuppa (Soup) - two offerings came to the table and we began with a tasting portion of the Zuppa di Fagioli - A creamy soup made of Cannelloni Beans and flavoured with some chilli, parmesan cheese and served with a Foccacio Pugliese to mop up all the soup that always manages to escape the spoon. A lovely soothing soup this one is. 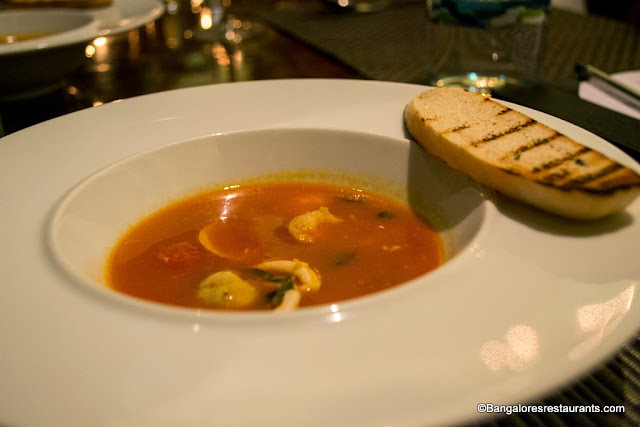 My pick however was the Zuppa di Pesce or the Fish based soup. The flavour of this one will change with the day, as chef prefers to check what fresh catch is available for the day and then get to preparing this. On this evening, our soup had some calamari and something that took me back to my mother's kitchen - cockles. These little shells stick had their flesh ensconced in them and it was a pleasure scooping the bits out and indulging in this tomato-heavy bowl of homely goodness. 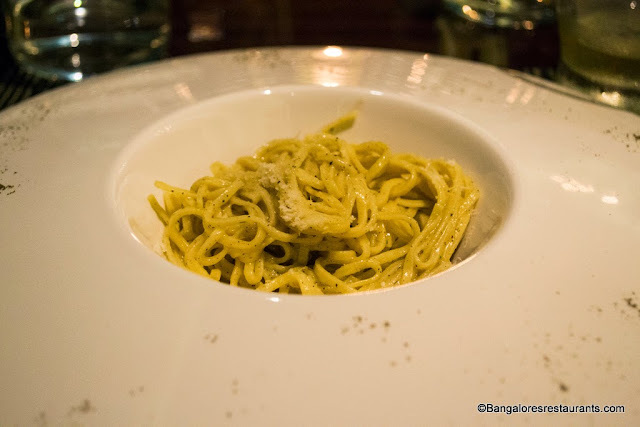 Moving on to the pastas - Chef made it a point to explain that he wanted to move away from the classics like Aglio Olio, Putanesca and Carbonara. And were we happy that he did. 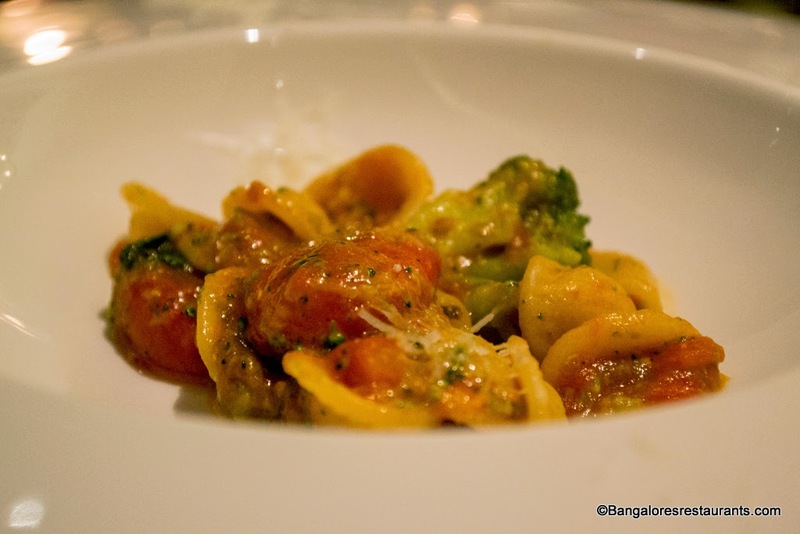 The first one to come out was the Orecchiette Alla Barese - These little round pasta were tossed in a cherry tomato confit with garlic, broccoli and the zesty pecorino cheese. Very satisfying. 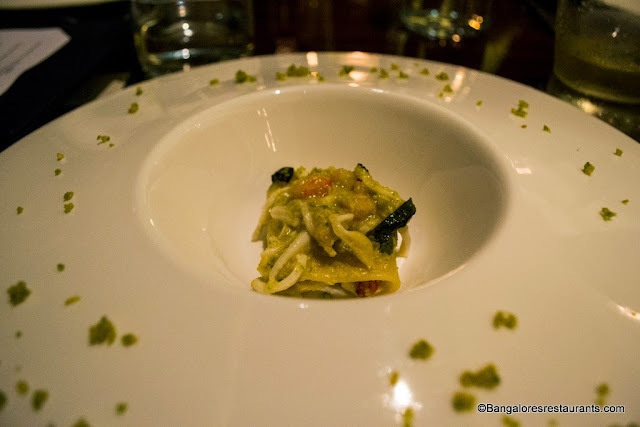 Next up was the Paccheri Mare e Monti - these large tube-like pasta fold down to look a bit like lasagne sheets - the pasta was stuffed with calamari and prawns in a white wine sauce and what elevated it to that memorable next level was a pistachio pesto, which replaced the traditional basil pesto. Again, the pesto goes against what you expect and is not grainy, but rather smooth, and a superlative addition to the dish. 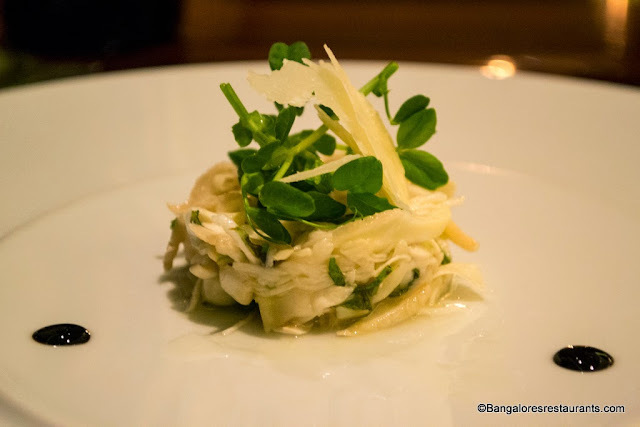 This dish, chef explained was a blend of Sicily and Naples in terms of origin. And we had another pasta, the Tonnarelli Cacio e Pepe, a Roma specialty made of Tonnarelli pasta in a Pecorino and black pepper sauce. This was definitely my pick of all the pastas served. The kick of the pepper and the unmistakable zing of pecorino make this a dish you don't want to miss. At this point, most of us at the table went into our second break of the meal. Despite indulging in tasting portions, we had a significant number of dishes done and were now going to move into the main courses. 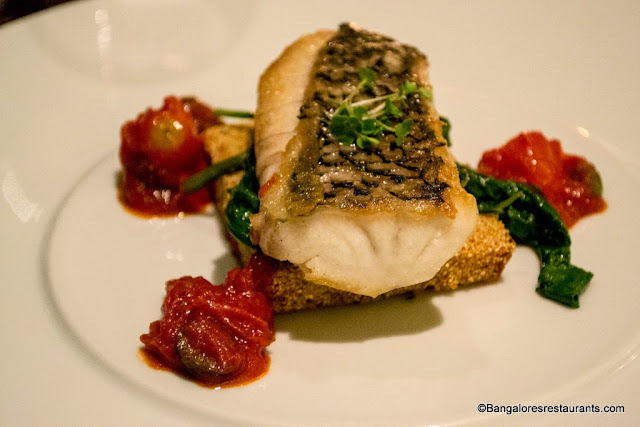 Short break later we began with the Branzino Livornese - A Baked Sea Bass, served on a bed of fried polenta with olives, anchovies, capers in a tomato sauce and spinach. The fish was delicately done, with a nice crisp skin. The polenta is the surprise package being uniformly crisp on the outside and deliciously soft on the inside. The combination of ingredients was a marriage made in marine heaven. 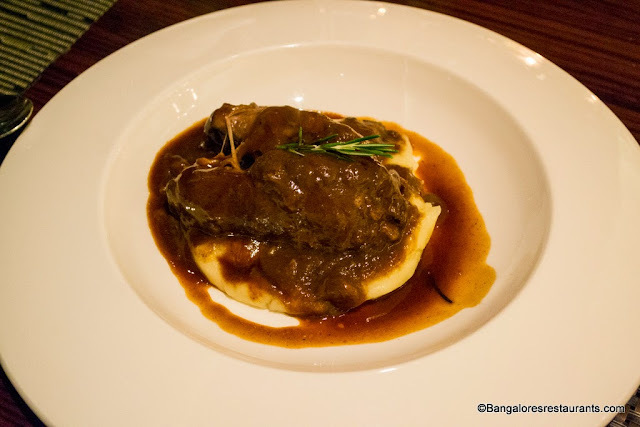 The Straccotto di Agnelio was next - a gorgeous Australian boneless Lamb Shank that had been slow cooked for close to 9 hours in red wine and served on truffle mash and rosemary sauce. Many find desserts to be a place where they find divine taste - for me it is in fantastically done meat dish. To use the cliches of being "melt in the mouth" would be disservice to how good this dish tasted. And the truffle mash... well I was quite tempted to asked for a separate bowl of it, instead of dessert. There were two other main courses on the menu, and it was with deep regret that the whole table begged to be excused and so we moved on to the Desserts. 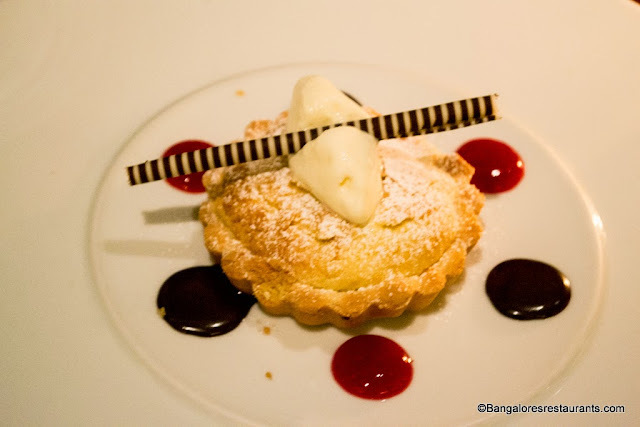 Two very interesting ones to choose from - Millefoglie - A warm dessert filled with custard, and topped off with a berry compote, all served with a scoop of vanilla ice cream. 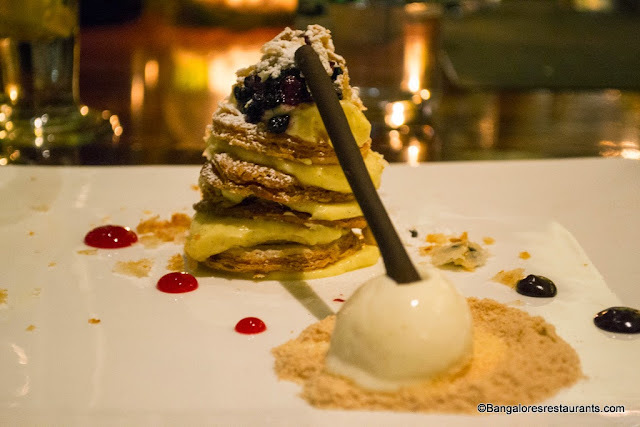 The Pasticciotto is shortbread pastry filled with custard, nutella and served with a side of vanilla ice cream. Both desserts will have you wishing you had left a sizable amount of tummy real estate because they are so good. The festival is on till the 23rd of May and Chef Giuseppe is a pleasure to have as a host. A meal for two will be approximately Rs 3000 plus taxes. The service, is as usual impeccable.